Robertson Boulevard has a higher collision rate – adjusted for traffic volume – than any other major street in West Hollywood. Santa Monica, Sunset, and Fountain have the most collisions on an unadjusted basis. That is according to a new report by WeHo By the Numbers, using data from the city and the California Highway Patrol. The analysis is based, in part, on 2,625 collisions reported between 2015 and 2017. 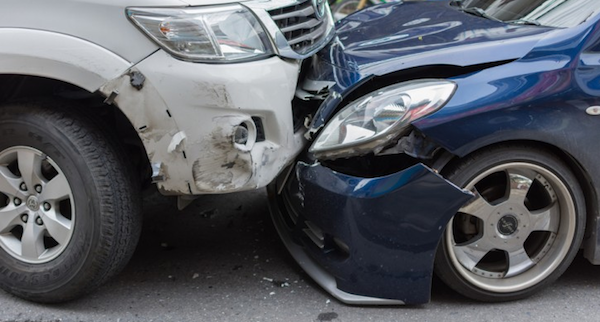 The annual number of collisions dropped over the three-year period. There were over 1,000 in 2015. In 2016, the number declined to roughly 800. For 2017, the preliminary count is below 800. A third of reported collisions occurred within 10 feet of an intersection. The 10 intersections with the most collisions were on La Cienega, Santa Monica, and Fountain. They were La Cienega and Sunset, La Cienega & Melrose, Santa Monica & Robertson, Santa Monica & San Vicente, Santa Monica & Crescent Heights, Santa Monica & La Brea, Fountain & Havenhurst, Fountain & Crescent Heights, Fountain & Hayworth, and Fountain & Fairfax. Together, those intersections represented a quarter of collisions in intersections or eight percent of the overall total. The intersection with the most collisions had less than one percent of the overall total. About 80% of all collisions happened on one of 13 major streets, or within 10 feet of them at an intersection. Three of those streets — Santa Monica, Sunset, and Fountain — together accounted for more than 50%. Santa Monica, all by itself, had 25% of the collisions. Since Santa Monica, Sunset, and Fountain are among the most heavily traveled streets in the city, it is not surprising that they also represent a large share of the collisions. The report explores their relative riskiness with a metric that adjusts for traffic volume and length: collisions per million vehicle miles. One of the city’s engineering firms did the calculations for major street segments using data from 2014 and 2015. 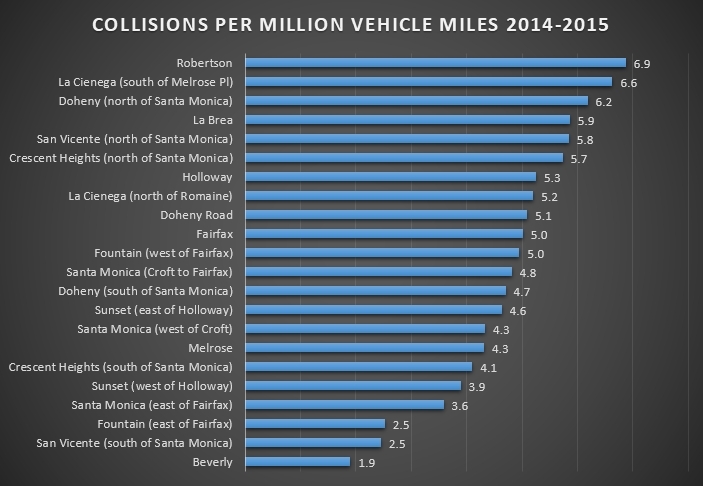 The collision rates for Santa Monica, Sunset, and Fountain were not in the top 10 after adjusting for traffic volume. The numbers show that drivers on Robertson faced the highest collision rate. There were 6.9 collisions per million vehicle miles. The southern part of La Cienega around Melrose came in second, with 6.6 collisions per million vehicle miles. Third place went to Doheny north of Santa Monica. The rest of the top 10 were La Brea, San Vicente (north of Santa Monica), Crescent Heights (north of Santa Monica), Holloway, the northern stretch of La Cienega, Doheny Road and Fairfax Avenue. For updated collision rates, see the full report Which West Hollywood streets have the most traffic collisions? Thanks for this. I’ve been looking for this information since this site began its campaign to change Fountain. Clearly, it is nowhere near the worst street in town. Robertson is definitely a mess. If only we would put the effort into trying to come up with a solution. 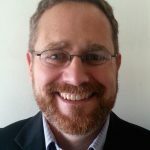 Over the past few decades Robertson Blvd has gotten busier and busier while nothing has been done to address the increased traffic due to the numerous restaurants, cafes and shops that have popped up. I have had to drive south on Robertson towards Wilshire and I can’t count how many drivers I notice driving recklessly. Moreover, the number of Jay-Walkers make me nervous. Not to mention the number of vehicles trying to navigate east or west from side streets trying to cross Robertson. Oh, and the Uber or Lyft drivers parked in red zones waiting for fares. Or the idiot double-parked while his/her partner is fetching coffee from the Starbucks. Pedestrians have it bad too. Robertson is awfully dangerous to cross, but Bianca Siegel won’t put in any more crosswalks. It may be decades before the pedestrian friendly streetscspe improvements ever get to Robertson.